Iran: No to war and sanctions! No to the Islamic Republic! On Sunday 26 February the Syrian regime held a referendum on a new constitution. That constitution declares that Syria will be a multi-party democracy. The opposition called for a boycott, saying that the old constitution bans torture and guarantees civil liberties, but as the government ignores that constitution, so too will it ignore any new one. The opposition Syrian National Council declared that what is needed is a new government. The voting took place amid widespread fighting. Homs was shelled by government troops for the 26th consecutive day. 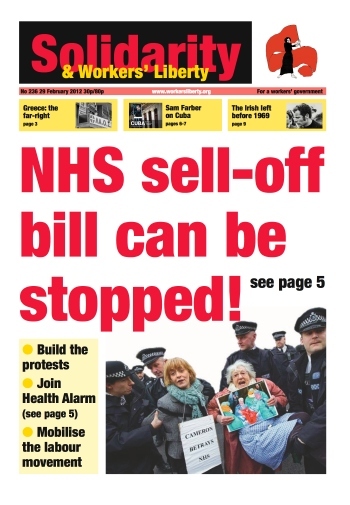 Wednesday 29 February, London: Protest at the “Winning Business in the New NHS” conference. 08:00-10:30, 11 Cavendish Square, London W1. Organised by Health Alarm mobilising committee. Thursday 1 March, south London: “No Queue-Jumping at St George’s”, demonstration at St George’s Hospital, Tooting, which plans to spend £100,000 a year on a “Private Patients Development Manager”. 12:30-14:00, outside St George’s entrance, Effort St, London SW17. Organised by SW London Keep Our NHS Public: Anne Marie Waters, amwaters@hotmail.com. On 27 February, the Daily Mail issued a front page rallying call to British business to save the government’s workfare programme. Quoting Sir Stuart Rose, former Executive Chairman of Marks & Spencer, the paper ordered firms to “show some backbone”. The Mail is responding to a wave of companies and charities refusing to take up the so-called “work experience” scheme. The list grows everyday and now includes TK Maxx, Sainsbury's, Waterstones, Shelter and Oxfam. GMB members working for contractor Carillion at Swindon’s Great Western Hospital began a further three days of strike action on Monday 27 February as their dispute over bullying bosses continues. The workers have already taken several days of strike action but are unhappy with Carillion’s refusal to even acknowledge that a problem exists. "We are not satisfied that they have taken the appropriate action against the accusations of bullying”, said Pablo Fernandez, a support worker at the hospital. A months-long battle between bus drivers and bosses at Stagecoach in South Yorkshire has concluded after workers voted to accept management’s latest pay offer. Workers at the Mayr-Melnhof Packaging (MMP) plant in Bootle, near Liverpool, are maintaining pickets of the factory after bosses locked them out during a dispute over redundancies. Managers at the plant responded to an official strike over job losses by locking out the entire workforce. The plant’s closure has already hit MMP’s customer’s supply chains, with production of Kellogg’s flagship brand Cornflakes reportedly suffering due to the lack of packaging production. Rail union RMT has sent a message of solidarity to their Israeli counterparts, currently taking strike action against the Israeli state’s privatisation agenda. Although such basic solidarity should be an instinctive reflex for any labour movement body, the message is significant because it cuts against a dangerous and growing consensus on the British labour movement left that the Israeli working class is irredeemably reactionary and that British unions should sever all ties with Israeli workers’ organisations. Journalists at newspapers in Essex have called off strike action after giving management one last chance over pay. National Union of Journalist (NUJ) chapels in Basildon and Colchester called off a three-day and one-day strike respectively after members decided to give Newsquest management until June to come up with a pay offer. The company had pushed back a January pay review date until June, saying they could not give a pay rise until the first quarter trading performance was known. The attempt by the UK’s major construction contractors to impose a new collective agreement for mechanical and electrical construction workers has collapsed after the remaining six companies followed industry leader Balfour Beatty Engineering Services in performing an embarrassing u-turn.